When the villagers of Wymeswold, in Leicestershire, decided how to remember their war dead they chose the practical option of a Memorial Hall, which was opened in 1924. Lists of the fallen were maintained in the two churches in the village. The parish church housed a printed roll of honour, with thirty names, whilst the Wesleyan congregation erected the monument illustrated here, which has twenty-eight names. 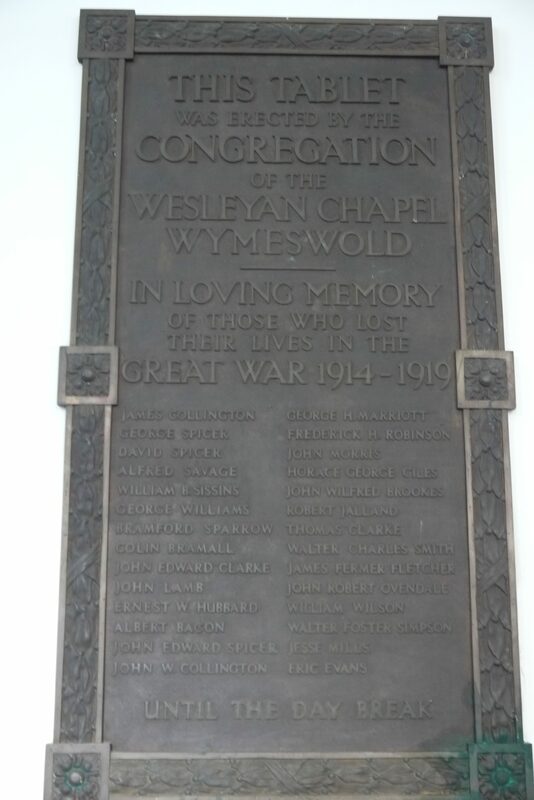 This work shows that all the men listed in the Wesleyan chapel have strong connections with the village, whereas the further two listed on the parish roll of honour had relations in Wymeswold. Ivor F. Perry is currently conducting further research into the religious affiliations of the men.